Enjoyed a lovely warm night in a cabin that covers our needs, more than amply. It is raining up here, so it’s not so bad being out of the caravan. We remembered to ring food and wine out of the Caravan, but no games, books etc. There’s a TV and a radio and I have my Sudoku puzzles to do. Russ realised today, after trying to download photos, that he hadn’t bought the CD program disk, to enable him to do this. After 2 hours of trying to download programs from the internet, he rang the kids! Deen told us about buying a flash card – problem solved – just a bit more money spent. At least the blog will now have photos!! We went to a great winery for tasting and ended up staying for lunch. 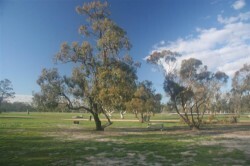 Trentham Estate, at Trentham Cliffs, right on the Murray River. We couldn’t have wished for a better location. The wines ranged from $10-$35 – old fashioned cellar door prices, and good to boot, with an excellent vintage port for $25. (Bought some of course to keep us amused after dinner tonight! We shared a Trentham Platter, consisting of pate, semi-dried tomatoes, prosciutto, olives, smoked salmon, grilled vegetables and chicken terrine, plus Caramalised Bush Tomato Balsamic, Olive Oil and Dukkah, served with freshly baked bread. Waddled out, feeling well sated and that things are looking up. Earlier, we bought some yabbies, thinking that tonight we would have them with garlic butter and ciabatta, but maybe they will be tomorrow’s lunch. We have a couple of photos to add. 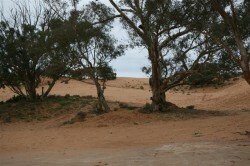 The first is the view from our camp and the other two are the Perry Sand Hills, east of Wentworth. 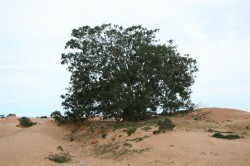 The red gum is 500 years old and 5 metres of its trunk might be covered with sand. Now that sounds much better. Just the sort of experience that you guys needed after your rocky start. Makes me salivate just reading about your delicious lunch. Today we went on the Walk for Harmony organised by the Multicultural Commission. Started with a group of friends at a Yum Cha in Lonsdale St and then walked to the Carlton Gardens where the walk began. Marched to Federation Square – very exciting with lots of different ethnic groups in national costume, drumming and a Chinese Dragon to entertain us. Tigs has cooked a Beef Vindaloo which we are about to sit down to, just to keep the multicultural theme going.